Photo. www.navsource.org . As Gurupi G 2 in Brazilian Navy 1946. By Jane's Fighting Ships Replacement from Robert Hurst. USS PC 554, was built at Sullivan Dry Dock and Repair Co., Brooklyn, New York. 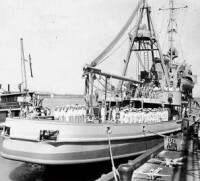 She was launched 1st May 1942. 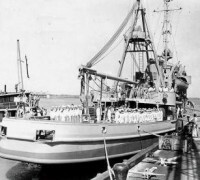 She was transferred and incorporated to the Brazilian Navy 29/Oct/1943 when was renamed Goiana in a ceremony in Miami, Florida.